When new love is brewing you want to share that joy with your friends and family! Treat them to a unique favor that will warm their hearts. 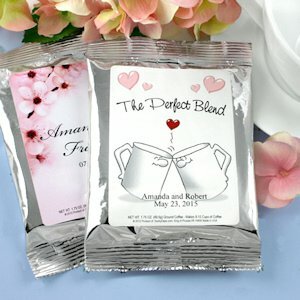 Personalized Wedding Coffee Favors are a great take home gift your guests can enjoy after your big day. Each silver packet of coffee makes an 8-10 cup pot. Choose from a variety of different designs and themes along with 3 lines of text. Each packet of ground Columbian house blend coffee yields one pot of delicious brewed coffee (8 to 10 cups). Packs are about 4.5" wide x 6" tall. 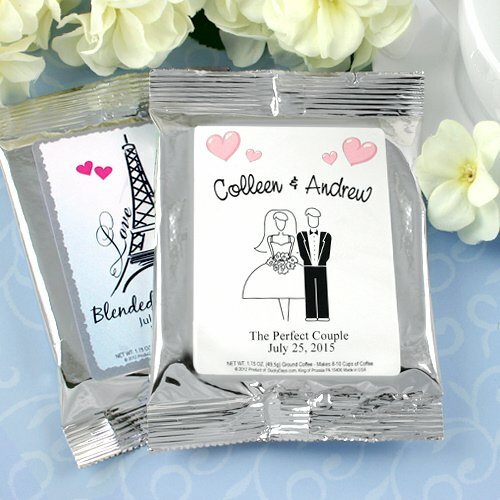 Coffee packets have a shelf life of 3 to 6 months. Decaffeinated coffee is not available at this time. Easy Assembly with self-adhesive labels, or for an extra fee we will apply the labels for you. Once you add them to your cart with your destination zip code, we'll provide the delivery dates.